Directions: Put beans into a medium bowl; cover with cold water by 2 inches. Refrigerate 8 hours. Drain beans and transfer to a large stockpot.Make bouquet garnish: Place bay leaves, thyme sprigs, and the peppercorns on a square of cheesecloth; tie into a bundle with kitchen twine. Add stock, onion, and bouquet garnish to pot with beans. Bring to a boil. Reduce heat to medium-low. Cover; simmer until beans are tender, about 1 1/2 hours. Drain beans, reserving cooking liquid. Discard bouquet garnish. Preheat oven to 350 degrees F. Using a keyhole saw, cut out tops of pumpkins, and reserve. Remove seeds. Rub inside of each pumpkin with the oil, and season with salt and pepper. 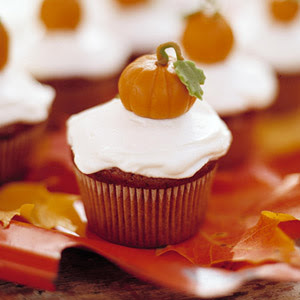 Place pumpkins and tops right side up on baking sheets lined with parchment paper. Bake 25 minutes. Remove tops; let cool completely on a wire rack, and reserve for garnish. 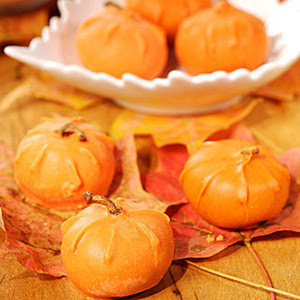 Turn pumpkins upside down, and bake until flesh is tender but firm, about 25 minutes more. Let cool completely on rack.Melt 1 tablespoon butter in a large stockpot over medium-high heat. Add sausage. Cook, stirring, until sausage is browned, about 7 minutes. Add remaining 2 tablespoons butter, the pearl onions, potatoes, carrots, leeks, and celery. Cook, stirring occasionally, until vegetables have softened, about 12 minutes. Stir in mushrooms and peas. Stir in flour, and cook 2 minutes.Reduce heat to medium. Add milk; simmer 5 minutes. Stir in beans, reserved cooking liquid, sage, thyme leaves, and 2 cups water. 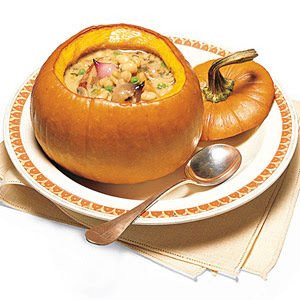 Bring to a simmer; cook until thick, about 30 minutes.Preheat oven to 350 degrees F. Divide the stew among pumpkin shells. Place on baking sheets, and bake until pumpkins are soft, about 15 minutes. Garnish with tops. Cut off the top quarter of an pumpkin (or orange as shown here). Scoop out flesh with a spoon, then carve eyes, noses, and grins with a utility knife. Slice off the top quarter of each pumpkin, and reserve for lid and scoop out the interior of pumpkins. 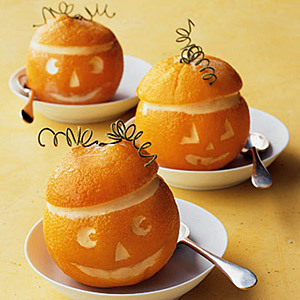 Pack each pumpkin with sorbet (or your choice of ice cream) and top it with a "lid." NOTE These are shown with oranges so to create the the stem if you choose this route, bend floral wire, and poke it in ~ not through ~ top of orange for tendrils. Transfer to a parchment-lined baking sheet, and place in the freezer until firm, about 30 minutes. Directions: Place chocolate in a large bowl; set a fine-mesh sieve over bowl of chocolate and set aside. In a small saucepan, bring cream and cloves to a boil over medium heat. Let cream boil 1 minute; remove from heat and immediately strain cream into bowl of chocolate, discarding cloves. Using a spatula, stir chocolate until smooth and slightly cooled. Add butter and whisk into chocolate mixture until smooth. Slowly add whiskey, while continuing to whisk, until mixture is well combined, scraping down the sides of the bowl as necessary. Cover and refrigerate until slightly firm, about 45 minutes. Transfer chocolate mixture to a pastry bag fitted with a large open-star pastry tip. Make a small hole in the bottom of each fig; fill each with chocolate mixture until plump. Set aside. Line 2 baking sheets with parchment paper and set aside. Place candy wafers in a microwave-safe bowl and microwave for 30 seconds at half power. Stir, and repeat process until candy wafers have melted. Add a few drops of gold food coloring, stirring, until desired color is reached. Working with one fig at a time, holding the stem end, dip fig into melted candy wafers to coat. Create ridges in the "pumpkin" by pressing down into the coated figs with the side of a fork. Transfer to prepared baking sheets. Repeat process with remaining figs. Transfer figs to refrigerator until set, about 10 minutes. Directions: Preheat oven to 350 degrees F with a rack set in the center of the oven. Line a baking sheet with a nonstick baking mat or use a Dutch oven that is slightly larger in diameter than your pumpkin (in which case, you will need to serve your pumpkin from the Dutch oven, as it may stick, but it will keep its shape better this way). Using a sharp, sturdy knife, cut off top of pumpkin, working around the top with the knife inserted at a 45-degree angle to cut off enough to make it easy to work inside the pumpkin; reserve top. Remove seeds and strings from cap and pumpkin. Season inside of pumpkin generously with salt and pepper. Place on prepared baking sheet or in Dutch oven; set aside.In a large bowl, toss together bread, cheese, garlic, bacon, chives, and thyme until well combined. Pack into pumpkin; it should be well filled but not overstuffed. You may need to add some bread and cheese or some of the filling may not be necessary to use. In a small bowl, stir cream and nutmeg to combine. Pour over filling; filling should be moist but not swimming in cream — you may need to use more or less accordingly.Place top on pumpkin and transfer to oven; cook until filling is bubbling and pumpkin flesh is tender, about 1 hour and 30 minutes. Remove top and continue baking until liquid is slightly evaporated and top of filling is browned, 20 to 30 minutes more. Directions: Preheat oven to 350 degrees F. Line two muffin tins with paper liners. Grate pumpkin in a food processor or on the large holes of a box grater (you should have about 2 1/2 cups). Transfer to a medium bowl, and add pumpkin puree and pecans. In the bowl of a food processor fitted with the metal blade, combine flour, sugar, baking powder, baking soda, salt, cinnamon, ginger, nutmeg, and cloves; pulse to combine then add oil and eggs; process until smooth. Add pumpkin mixture; pulse to combine. Spoon about 1/3 cup batter into each cupcake liner. Bake until a tester inserted in the center comes out clean, about 25 minutes. Directions: Make the Candied Pumpkins: Cut top one-third of pumpkins and remove seeds from pumpkins and tops; set aside.In a small dry skillet, toast cinnamon, nutmeg, star anise, cloves, and peppercorns over medium heat until fragrant. Remove from heat and transfer to a small piece of cheesecloth along with ginger; tie with kitchen twine to enclose.Place 2 cups sugar, cheesecloth packet, and 3 cups water in a large saucepan; bring to a boil over medium-high heat. Add pumpkins and tops, making sure liquid fills the cavity of each pumpkin, and return to a boil; cook for 5 minutes.Add 1 cup sugar to saucepan and return to a boil; let cook 5 minutes more. Add remaining cup of sugar and cook until pumpkin flesh is translucent, about 20 minutes, brushing pumpkins occasionally with cooking liquid. Remove saucepan from heat and let pumpkins and tops cool in liquid. Invert pumpkins onto a wire rack set over a rimmed baking sheet to drain. Make the Pots de Creme: Fill a small saucepan with 3/4 cup water; add molasses or sugar and bring to a boil over medium-high heat. Cook until sugar is dissolved. Remove from heat and let sugar syrup cool completely. Preheat oven to 325 degrees F.In a large bowl, whisk together sugar syrup and egg yolks until well combined. In a medium saucepan, whisk cream and milk; bring to a boil over medium-high heat. Slowly whisk milk mixture into yolk mixture. Strain through a fine-mesh sieve.Place pumpkins in a large 2-inch-deep roasting pan. Fill pumpkins with custard to just below the rim. Set roasting pan on rack in oven. Fill pan with enough warm water so that it comes 3/4 of the way up the sides of the pumpkins. Cover pan with parchment paper-lined aluminum foil and slide into oven. Bake until edges of custard are set but center is just a little loose and custards are slightly domed, 40 to 45 minutes.Let pumpkins cool in water in roasting pan for 20 minutes. Remove from water and transfer to refrigerator to chill.When pumpkins have chilled, sprinkle tops of custards with turbinado sugar. 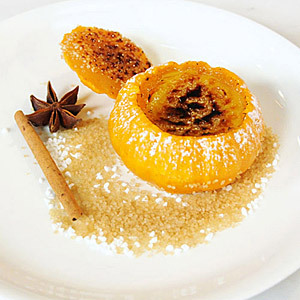 Using a kitchen torch, melt turbinado sugar to form a crust. Dip pumpkin tops in turbinado sugar. Place confectioners' sugar in a small sieve and sift over pumpkins. Directions: Prepare cookies: Preheat oven to 375 degrees F. Sift together flour, cocoa powder, baking soda, and salt into a medium bowl; set aside.Place butter, shortening, and sugars into the bowl of an electric mixer fitted with the paddle attachment. Mix on high speed until smooth, about 3 minutes. Add egg; mix until pale and fluffy, about 2 minutes. Mix in half the flour mixture, then the milk and vanilla. Mix in remaining flour mixture.Drop about 2 teaspoons dough onto baking sheets lined with parchment paper, spacing 2 inches apart. Bake until cookies spring back when lightly touched, 12 to 14 minutes. Transfer baking sheets to wire racks and let cool 10 minutes. Remove cookies from baking sheets and transfer to wire racks using a spatula; let cool completely.Prepare filling: In the bowl of a mixer fitted with the paddle attachment, whip together cream cheese, butter and confectioners' sugar on medium speed until smooth, about 3 minutes. 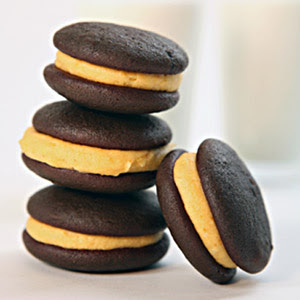 Add pumpkin, cinnamon, and nutmeg; whip until smooth, scraping down the bowl as necessary.Pipe or spoon about 2 teaspoons filling on the flat sides of half the cookies. Sandwich with remaining cookies, keeping the flat sides down. Directions: Preheat oven to 400 degrees F. Place pumpkin halves, cut sides down, on a rimmed baking sheet. Bake until soft, about 50 minutes. Scoop out flesh, and puree in a food processor (you should have 2 cups). Melt 1 tablespoon butter in a small saucepan over medium-high heat. Add reserved seeds and fibers from pumpkin, and cook for 4 minutes. Add stock, water, and thyme, and bring to a gentle simmer. Cook for 9 to 10 minutes.Meanwhile, melt remaining 5 tablespoons butter in a large saucepan over medium-high heat. 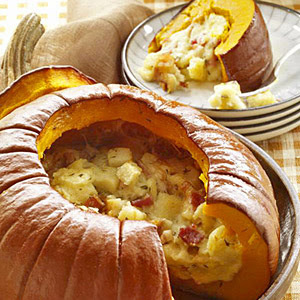 Add pumpkin puree, parsnip, potato, and cook for 5 minutes. Add shallots, and cook until soft, about 4 minutes. Add wine, and cook until liquid has reduced by half.Strain pumpkin-seed mixture, reserving broth and discarding solids. Add broth to pumpkin-wine mixture. Bring to a simmer; cook 20 minutes. 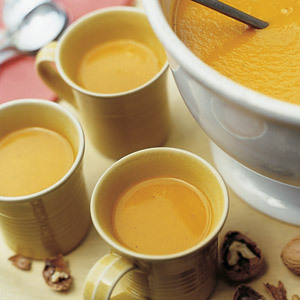 Let cool.Pass soup through a food mill into a clean saucepan, or puree in a food processor in small batches until smooth. Heat soup in a saucepan over medium-high heat. Stir in cream, sugar, salt, and pepper, and serve. Directions: Preheat oven to 350 degrees F, with rack in center. With an electric mixer, beat cream cheese and sugar on low speed until smooth; mix in flour (do not overmix). Add pumpkin puree, pie spice, vanilla, and salt; mix just until smooth. Add eggs one at a time, mixing until each is incorporated before adding the next. 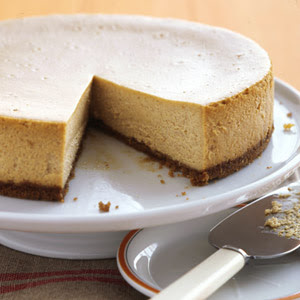 Pour filling into crust (o save time, try a ready-made graham-craker crust), and gently smooth top. Transfer to oven; reduce oven heat to 300 degrees. Bake 45 minutes. Turn off oven; let cheesecake stay in oven 2 hours more.Remove from oven; cool completely. Cover with plastic wrap; refrigerate until firm, at least 4 hours. Directions: Place one disk of dough on a lightly floured work surface; roll out to 1/8 inch thick. Cut out six 6-inch rounds, gathering scraps and re-rolling dough once if needed. Fit rounds into six 3 3/4-inch fluted tart pans with removable bottoms. Trim dough flush with tops. Refrigerate on baking sheets 30 minutes. Repeat with second disk of dough.Roll out remaining dough to 1/8 inch thick. Transfer to a parchment lined baking sheet. Refrigerate 30 minutes.reheat oven to 375 degrees F. Whisk pumpkin, 1 cup cream, whole eggs, honey, sugar, salt, and spices in a large bowl. Divide among tart shells. Bake tarts on baking sheets until edges are golden brown and filling has set, about 30 minutes. Let cool on wire racks. Keep oven on.sing a paring knife, cut out jack-o-lantern features from the chilled dough; transfer cutouts to a parchment lined baking sheet.Chill in freezer 15 minutes. Whisk yolk and remaining 2 tablespoons cream in a small bowl. Brush cutouts with the egg wash. Bake until golden brown, about 9 minutes. Let cool completely on a wire rack. 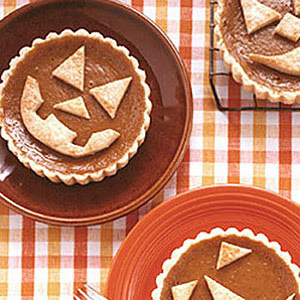 Arrange cutouts on top of cooled tarts, and serve. Directions: Preheat oven to 350 degrees F. Brush 12 jumbo muffin tins with oil; set aside. In a medium bowl, whisk flours, baking powder, pumpkin pie spice, and baking soda; set aside.In a large bowl, whisk oil, pumpkin purée, yogurt, eggs, and 1 cup sugar to combine; add 1 cup walnuts and reserved dry ingredients. Mix just until moistened. 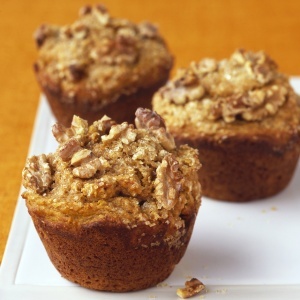 Divide evenly and spoon batter into muffin tins; sprinkle tops with remaining walnuts and sugar. Bake until a toothpick inserted in the center of a muffin comes out clean, 35 to 40 minutes. Cool 5 minutes in pan.